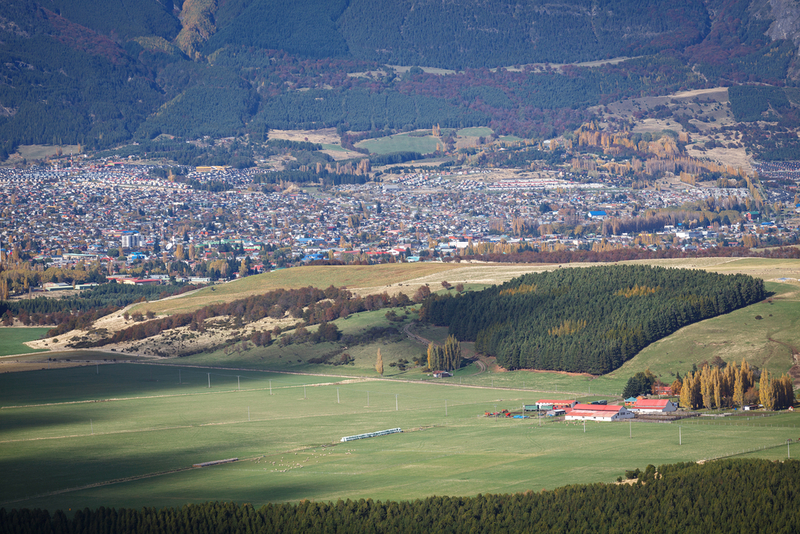 This town lies on the banks of the río Aisén and has a population of 14,000. Nowadays, the majority of service provision for the islands is concentrated here. You can visit Lago Los Palos, which is in a colonized valley, surrounded by vegetation in beautiful, natural countryside. You can also visit Puerto Chacabuco, which took the place of Puerto Aisén in the sixties. It now holds a ferry terminal and a port for large ships. Food and hotel accommodation are also available in the town. This park takes its name from the río Simpson, which runs through it towards the west and is one of the best fly-fishing rivers. You can reach the park by the paved road from Puerto Chacabuco to Coihaique, 37 km along. Points of interest in the park include the río Correntoso, which flows into the río Simpson, and the Cascada de la Virgen, both of which are surrounded by beautiful countryside and lush vegetation. This ski center is located 29 km from Coihaique at more than 1,000 meters above sea level, and offers ideal skiing conditions. There are five pistes and two lifts set among forests of lenga and ñirre, which give the area a very special beauty. The center has a total skiing area of around 550 hectares. The winter sports center operates from Thursday to Sunday and offers services such as ski hire, patrols and ski school. These lakes are located 42 km south of Coihaique. They are linked together by short channels which pass through the surrounding mountains and steep cliffs. These lakes are: lago Azul, lago La Paloma and lago Desierto. They are frequently visited by tourists and fly-fishing enthusiasts. These three lakes are located about 34 km southeast of Coihaique. You can reach them by a gravel road which is in good condition in spring and summer. Its natural beauty makes it a perfect spot for taking photographs. There is a great stock of rainbow trout for those who come to fish on the three lakes. A beautiful lake in the Coihaique area, it is to be found 33 km along the road to Balmaceda and covers an area of 2,510 hectares. You reach the lake along a gravel road and it is a good site for trout fishing, photography and hiking. Located 26 km northeast of Coihaique, this beautiful lake is set in lush grassland. It has a gravel bed and is surrounded by reeds. Lenga is the predominant species of tree in the surrounding woods, with occasional ñirres and ciruelillos. The bird-life of this area is of particular interest, with species such as quetru volador (flying steamerduck), large and small jergón, royal ducks, common tagua and huala. You can also spot eagles, peucos, abutardos and foxes. Located 25 km from Coihaique, this exuberantly beautiful little lake is full of natural attractions. Its many hidden corners provide beautiful compositions, making it an excellent place for photographers. From this lake there is also a fine view of the impressive waterfall, down which its waters run into Lago Elizalde. This lake is up in the mountains, 22 km from Coihaique on the road which leads to Coihaique Alto. There is a small beach and pleasant spots to camp or have a picnic. Laguna Escondida is just over 4 km further up the same road. It is an excellent spot for recreation and relaxation. There is scope for pleasant excursions to observe the wildlife of the area. Leaving Coihaique on the Pan-American Highway South, you will find the Laguna Foitzick about 7 km from the city. It freezes over in winter and in summer you can see ducks and swans. It is surrounded by rocky formations and marshy land and you cannot miss seeing it as you travel south on the Carreterra Austral. Towards the south you will pass a turning heading east for the Frío, Pollux and Castor lakes. Near here is the El Fraile ski center. You reach this reserve about 5 km along the road from Coihaique to Puerto Aisén. The road is paved as far as the turning for the lake. This and other small roads are only open during summer for normal vehicles, but four-wheel drive vehicles can use them all year round.